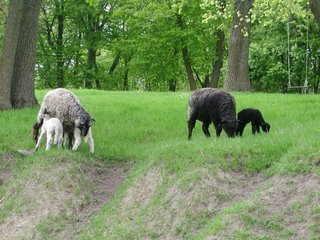 For those of you not familiar with our flock, we bought two ewe lambs in fall 2004 to start things up after my fence-building period. We ended up going with “cafe names.” The mostly white ewe is named Latte, whereas the mostly brown ewe is named Mocha–when we had a black steer with a few white splotches, we named him Macchiato, but he is no longer with us. Although they got to know a ram in their ewe lamb days, no pregnancy took. So, we were quite pleased when three lambs were born this spring after spending time with their “boyfriend” at our neighbor’s farm. Latte gave birth to twin ewe lambs and Mocha gave us this weather lamb (left). We’re a bit confused about his name right now. 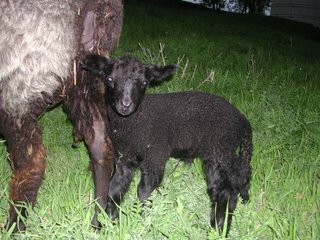 I call him blackie, my wife likes the Germanic Schwartz, although since he’s destined for a short life, Lambchop makes sense. For those of you not familiar with terminology, a weather is a castrated male sheep, whereas a non-castrated sheep is a ram. 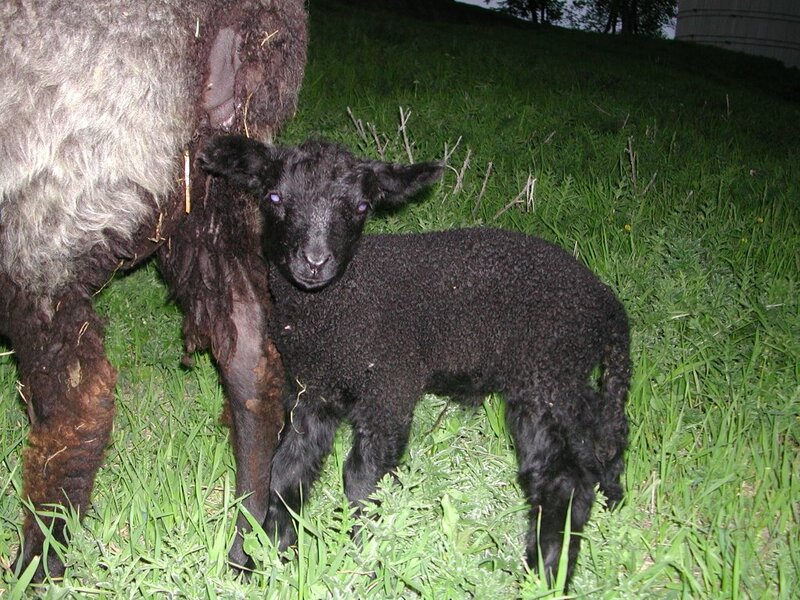 Blackie, here, is a lamb in process. He’s been banded and will be offically a weather in a week or so. Latte’s two ewe lambs are named Boo and Baa, after the two lamb characters in a Norweigan boardbook of Sylvie’s. The story is pretty stupid–these two lambs go boating together in the ocean–but we like the names, especially since they are a pair. 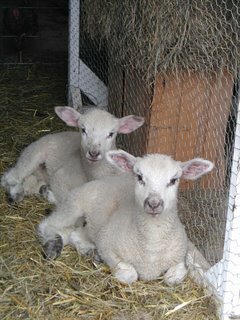 Boo and Baa came, oddly, at 4 in the afternoon in late April. From my experience (which is not great), most births come at night and early morning. Paul and Chris Burkhouse of Foxtail Farm (Osceola, WI) have always kept of flock of 20-30 and showed me the ropes when I worked for them two seasons in 2000 and 2001. Because of this experience, I felt more familiar with sheep than other livestock, so it was only natural to start with sheep when we bought our farm. Also sheep are quite manageable and independant. Give them pasture and they’ll do just fine. This picture illustrates the life of a sheep quite well. The ewe’s graze from dawn til dusk and the lambs abuse their mothers’ udders and nurse between romping around the countryside. We have only one fenced pasture and it sits behind our barn. The area was previouly mowed, but this didn’t make sense to me. I figured we’d save the gas and time and let the sheep do the mowing. The fence was the first project I did when we moved here in summer 2004. If you’re in the produce business, you need livestock of some sort. Manure doesn’t grow on trees (that’s a strange saying, isn’t it?) And places like the steep hill behind the barn should be pasture. You sure aren’t going to till the ground!